Linebacker Ikemefuna Enemkpali found himself out of a job Tuesday after he broke New York Jets quarterback Geno Smith’s jaw over, reportedly, a $600 plane ticket. The third-string linebacker came out of the exchange okay, though, quickly getting picked up by the Buffalo Bills. Meanwhile, Smith is in a bad spot: Not only is he going to miss half the season, but he’s clearly having trouble getting his affairs in order. We understand. $600 is a lot of money, even for a guy on a four-year contract with $3 million guaranteed. Who among us can’t relate to the experience of being 25 years old, having your first grown-up job, getting bowled over by a sudden, alarmingly large bill, and having no way to pay it because you blew your paycheck on Xbox games? We’ve all been there. We’ve all needed someone to extend a hand—not to smash our jawbones, but to help. 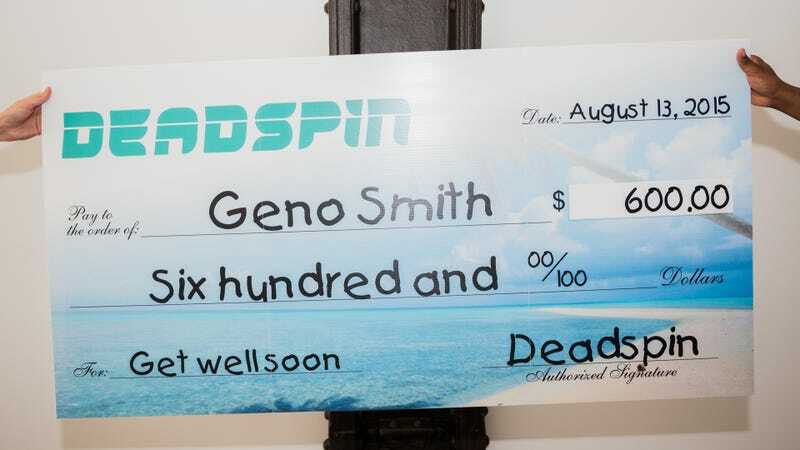 We’d like to present Geno Smith with a check for $600, which he can use to pay off his debt to his large, imposing ex-teammate. He can come by our office during business hours to pick up both the check above and one he’ll be more easily able to deposit at the bank, and to fill out a W-9 form, which our finance department tells us is a requirement for a sum this large. If you’re Geno or his agent, please email us so that we can set up a meeting, complete with a nice photo opportunity. We’ll even let the Jets put it on their website.